Little attention has been paid to nucleophilic reactants when considering the biologically important transformations of nucleic acids. 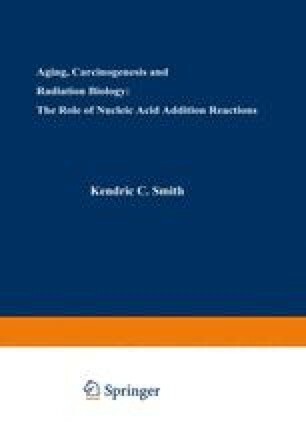 The role of free radical processes in the radiation chemistry and photochemistry of nucleic acids is well appreciated (Smith, 1975). In the case of chemical carcinogenesis, it has been suggested that the ultimate carcinogens are often, or perhaps always, strong electrophilic reagents (Miller, 1970; Heidelberger, This Volume). Nucleic acids, do, however, contain a number of sites susceptible to nucleophilic attack, and there is no obvious reason why alterations at these positions should be of less significance then changes produced at other locations by other mechanisms. In fact, nucleophilic reactions on nucleic acid are involved in a number of biologically important processes.